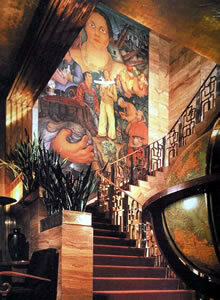 The Mandarin Oriental in San Francisco is one of those hotels which I have come to regard as a friend. 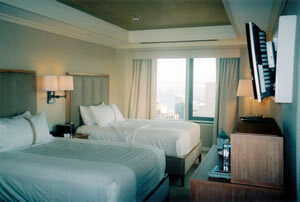 On this visit I was on the 43rd floor of the hotel. An express lift therefore whizzed me up. (And I do mean ‘whizzed’. These machines travel at ear-popping speed.) And there was room 4316 (pictured) – an Executive Twin. (I hesitate to give a price, as the rates alter greatly according to date, so it is advisable to check on the hotel website.) This was a corner room and therefore had views on two sides. My photograph will give some idea of the impressive panorama. 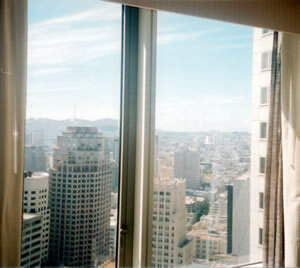 All the rooms at the Mandarin have lovely views, because of the enormous height of the building. Even some of the bathrooms – attached to the ‘Mandarin King’ and ‘Golden Gate’ rooms – share this privilege, which is a special joy for those of us who tend to linger over our ablutions. The bathroom to 4316 did not, but I still liked its beige and brown marble, walk-in shower, decent tub and Molton Brown toiletries. The bedroom’s colour scheme was discreet and restful, with much use of bleached wood, and its lighting – from a standard lamp, a table lamp and wall lights – enabled me to create a pleasing atmosphere. I could thus sit in the easy chair and look out of the windows with the pair of binoculars provided, as the cd player brought me the strains of Mozart. This machine was but one of the many technological delights available. Most of them were beyond my understanding. I wondered what an “ipod docking system” might be. But I could cope with some of the offerings: the very efficient air conditioning system, the iron and ironing board and the large flat television. And, when I was done playing with these, there was always the lovely bed (one of two) – made extra soft at my request – for my afternoon doze. Dining is done on the ground floor at the Brasserie S & P. (The letters refer to the hotel’s location at Sansome and Pine.) This is a room, off the lobby, which continues the decorative theme of the bedrooms, with soft colours, bleached wood and soft lighting. 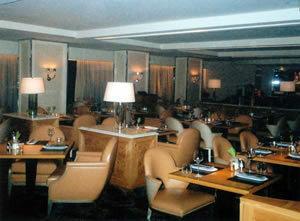 Its chairs are upholstered in leather and its tables are square and wooden. In the evenings there is canned music, but of the inoffensive kind – Sinatra et al. The good glassware is by Schott, the napkins are grey and the service is friendly and correct (with napkins re-folded when one leaves one’s place for a moment). 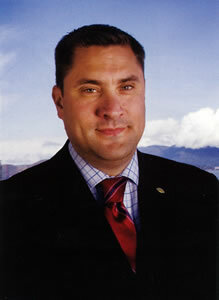 The Assistant Restaurant Manager and Sommelier, Jon Allen, looked after me well, as did my waitress, Kathryn. Executive Chef Adam Mali serves food which is straightforward and based upon the principle that good ingredients should be handled simply and honestly. I began my dinner with an admirable example of his approach: a baby kale parmigiano salad, with Caesar vinaigrette, white nectarines and pine nuts – as fine a combination of tastes and textures as I have eaten for some time. Then came some high quality prosciutto with figs and toasted hazelnuts – slightly overpowered, for my palate, by the Point Reyes blue cheese. My main course was certainly the star of the show. This was really gorgeous roasted duck breast (from Liberty Farms) with roasted figs, snap peas and potato purée. This was again, of course, essentially simple, but it was wonderful meat, wonderfully cooked. I finished with caramel corn panna cotta with berry coulis, something – forever the child – I could not resist. When I asked for the wine list, I was startled to have an ipod put into my hand. I suppose I will have to get used to this, although I will go to my grave preferring a list in proper book form. After some instruction, I managed to find my way about the 600 offerings – although I must crave your indulgence if I am mistaken when I report that prices range from $28 for an Argentinian white to $2,400 for the 2005 vintage of Chateau Margaux. Other interesting bottles to come before me on the screen were: from Australia, 2004 Grange ($795); from Chile, 2004 Almaviva ($162); from Italy, Mr Gaja’s 2005 Barbaresco ($490); and from California, 2006 Opus One ($400). My own drinking was all Californian and included a massive chardonnay from the Russian River (Medlock Ames 2009 - $20, glass) and a Bordeaux blend from the Napa Valley of exceedingly ripe black fruit (Blackbird ‘Illustration’ 2006 - $90, half). 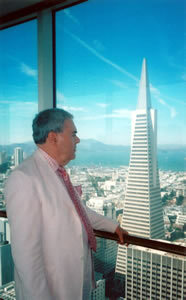 I left the Mandarin Oriental San Francisco as I always leave it: sad to be going, but pleased to think I might return. That, after all, is how you feel when you leave a friend. 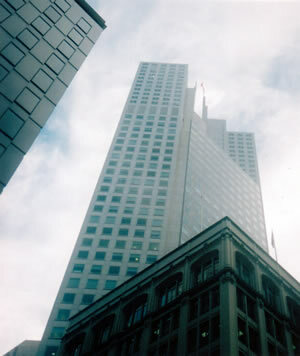 222 Sansome Street (between Pine and California), San Francisco, California 94104, U.S.A. Check rates on the internet, and ask about special offers.